She was firm in the face of adversity. 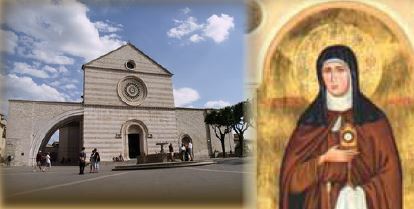 The famous incident, which we call the Miracle of the Eucharist of Assisi, took place at San Damiano in 1241, twelve years before Clare died. The catalyst that the Lord used to bring about this miracle was a German prince, Frederick II of Swabia. There is a tradition that Frederick was born in Assisi at the same time as Francis, and was baptized on the same day in the church of San Ruffino. The Pope had treated this Frederick very well, being sure he was brought up comfortably, affording him every courtesy. The young German repaid his kindness by turning on the Pope and the Church, waging a war against them, and the people of the Umbria. He had visions of an empire that would spread itself from Assisi down to Sicily. To this end, he recruited a band of Saracen (Arab) mercenaries to be his army. Reinforced by his band of merciless cutthroats, Frederick proceeded to march against Assisi. 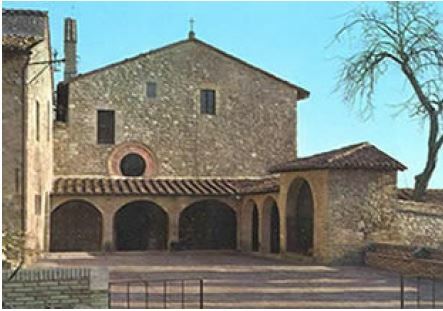 The convent of San Damiano stood between the troops of Frederick II and the city of Assisi. The fact that there was a group of virgin nuns in the convent was particularly appealing to the Saracens, who hated Christians, and had a lusty appetite for Caucasian women. They proceeded to attack the Convent. Clare was sick in bed at this time. Her ladies rushed to her, crying, in a state of panic. What would they do? Could she protect them from the attacking soldiers? One of the Sisters ran into the room to report that she had seen soldiers in the fields close to the convent. A general state of alarm broke out. She took the monstrance and held it high in the air.The advancing Saracens froze in their tracks at the courtyard of the Convent. They looked up at Clare, at the Monstrance in her hand. Petrified with fear, as if they could recognize the God Who was there, they turned and ran, fleeing from the convent of San Damiano, leaving Clare and her Sisters in peace. 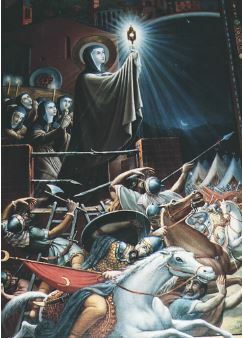 The next day, the people of Assisi were pleased, but astonished that the Saracens had not attacked their city. Survival not conquest, uppermost in their minds, the invaders had left without ever setting foot in the town. This entry was posted on Monday, August 10th, 2015 at 7:06 am and is filed under Uncategorized. You can follow any responses to this entry through the RSS 2.0 feed. You can leave a response, or trackback from your own site.